Brrr... how cold is it this week! When I leave home in the morning, I've been wearing thermals, tights AND a massive down jacket, and I'm still cold! This is the time of year where I like to hibernate on the couch with the doona and dream of warmer, sunnier climes. Unfortunately, exotic travel isn't on the cards for me right now, so on Sunday I thought it would be the perfect night to stay in and bring the warmth to me, with a nice hot bowl of stew. Another reason for making the stew was that I wanted to try out Jamie Oliver's dumplings (minds out of the gutter, kids! ), the recipe for which is here, and in the Ministry of Food book. 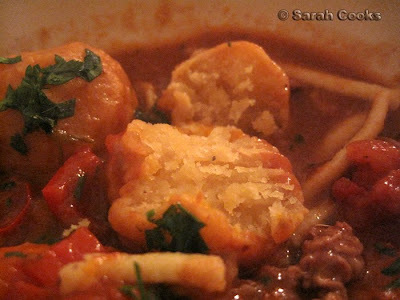 I'd never had English stew dumplings, but assumed they'd be doughy and crunchy and soak up all the delicious stewy juices. They didn't turn out quite as I'd hoped, but more on that later. 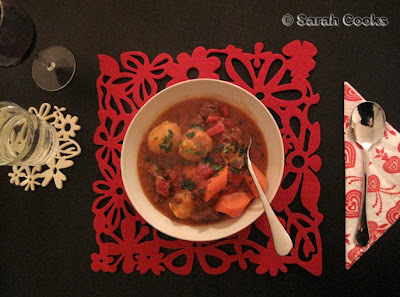 I made a standard beef and red wine stew, you know the drill. I coated pieces of beef in seasoned flour and browned them, then cooked some thinly sliced onions, added red wine, stock, tomatoes, carrots and capsicum. Then it was simply a matter of shoving the whole pot in the oven and cooking it on a low heat for 3-4 hours. The main benefit of slow-cooking, apart from the wonderful aroma and the super-tender beef it produces, is that it keeps the kitchen warm for hours! (So important now that I live in a place with no central heating). While that was cooking, I got on with the dumplings. English stew dumplings are quite different from the German potato dumplings or the Chinese meat-filled dumplings I know so well. 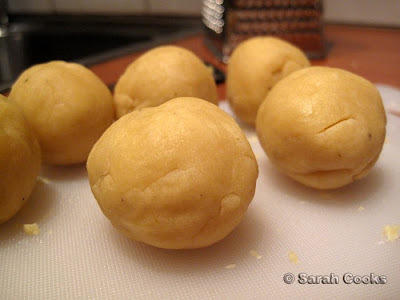 These ones are simply a pastry dough - half butter to flour, bound with a touch of water. A great tip Jamie shares is to grate the cold butter into the flour, making it very easy to rub it in with your fingers. (An especially handy method because I don't have a food processor at the moment). 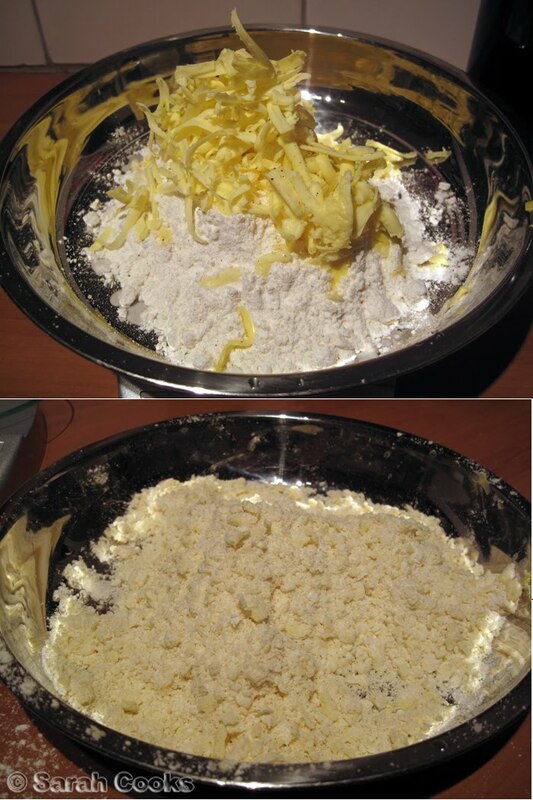 Once you rub the butter into the flour, you add a little water and form it into a dough. Jamie's recipe makes 12 dumplings, I halved it and made 6. I have to admit I was a little geeky about it, and weighed each ball (ooer) individually to get them all the same size - which happened to be 33 grams. So there you go. 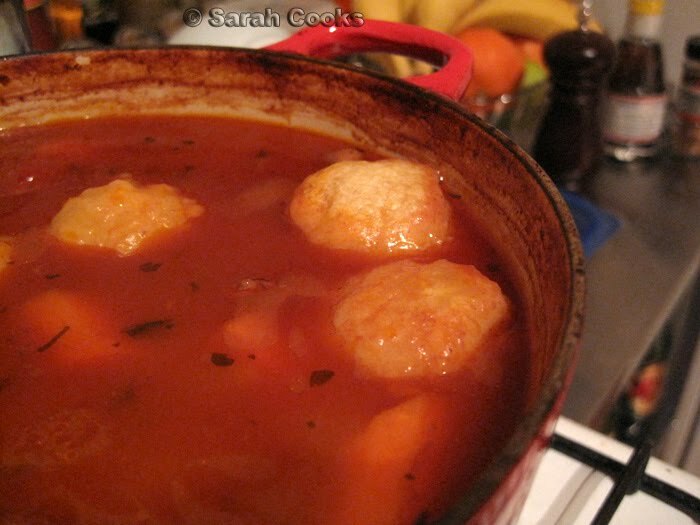 What you're supposed to do is drop the dumplings into the stew so they're half-submerged, and pop them in a hotter oven, covered, for half an hour. Huh? Was that right? They'd expanded a bit and absorbed some liquid, but where was the crunchy top I'd pictured, the fluffiness? The picture in the book and on the website are only of the raw balls (hehehehe), so I had no reference point. I opened one up to test it, and it was awfully doughy. I couldn't tell if it was cooked or not, so I took off the lid and put the whole lot back in the oven for another 20 minutes. After that time, they looked, well, exactly the same (and more importantly, I was hungry!) so I served it up. I do love the warm red and orange tones of this meal. I feel warmer just looking at it! As for the dumplings, they were, still, super doughy, and actually tasted just like raw pastry dough (unsurprising now that I think about it). I can't say I'm the hugest fan of these. In fact, I think I would have been better off rolling out the dough and making a crunchy pastry lid for the stew. Or, of course, making Schupfnudeln again. Well, the stew itself was a winner, and I'm glad I finally tried these dumplings, if for no other reason than I'll stop obsessing over them now! (And the butter-grating tip will make all kinds of scones and pastries a helluva lot easier!) They're just a little too stodgy for me. Has anyone else tried making English stew dumplings? What are your thoughts? Too heavy, or are you a fan of the stodge? Pity about the dumplings. Never a big fan. STew looks good though. 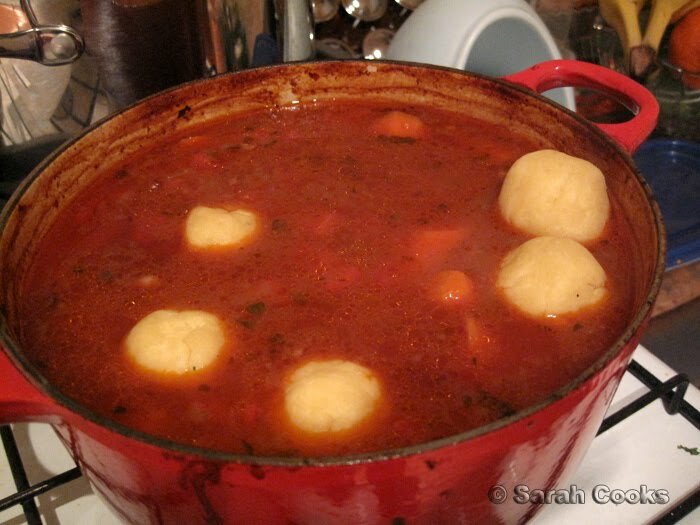 too bad about the dumplings, i'm a big fan of them too, my fave being the polish variety of klusdy, basically egg & flour dough dropped into chicken noodle soup, yum! They shouldn't taste like raw pastry dough. They should be fluffy, with a bread-cake like texture... they should be crunchy on top, and the bottoms should have soaked up some of the stew juices. Perhaps you made them too small? Not usre. However, when my mother comes back from her trip I'll ask her for her recipe to send you. She makes lovely dumplings. 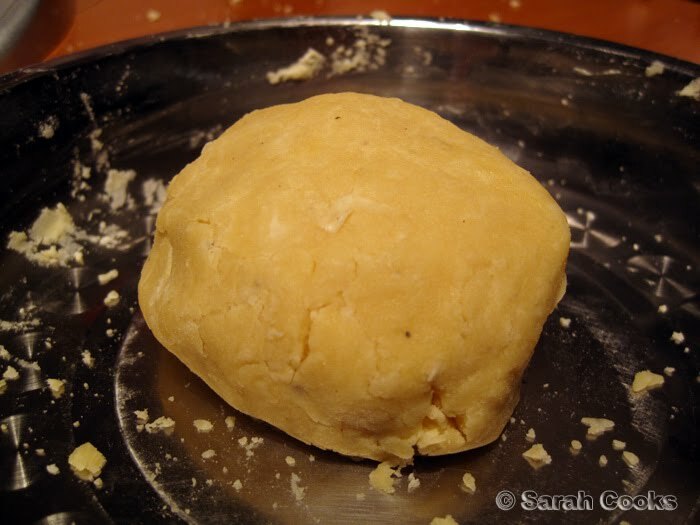 I think the issue might be with Jamie's recipe - I haven't seen dumplings made with butter before, they're usually made with suet, and although they're still fairly stodgy they should be a bit airier inside. (They don't really get crunchy, alas.) To be honest though, pastry and Schupfnudeln are both tastier options! I've done dumplings but with suet. The issue may have been that you halved the recipe. 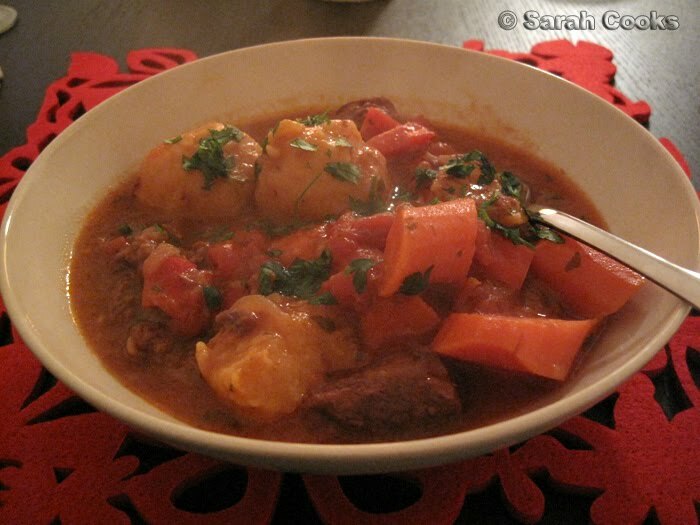 When I have put dumplings on top of stew they do tend to 'join together' at the top and crisp up- it has been years since I have made Delia's Lamb Stew with Dumplings... Might try that sometime soon. The dumplings I remember are light and fluffy, not stodgy like those on your pics. Perhaps try a different recipe? Kristene and Penny - Thanks! Ange - Mmm... kludsy sound good. I made griessklochen (semolina/egg dough dropped into chicken soup), also good! Jacey - Thanks for that! I'd love to have a look at your Mum's recipe. I was hoping for dumplings like the ones you described, but after reading the rest of these comments, I think English stew ones are meant to be stodgy (although not *quite* as stodgy as mine, lol). Fifikins - Thanks for that. I think the problem is that I assumed these would be light/crunchy/fluffy, like a savoury scone dough. Next time I make a topping I'll definitely look for something fluffier. I'd love the contrast between crunchy top and fluffy soggy underneath! Jo - Yeah I think British stew dumplings are meant to be a bit stodgy, but Jamie's are like MEGA DOUGHY STODGE TOWN. Next time I look for a fluffier recipe, hehe. Sounds like a really great recipe. Sarah - the ones my mum make, are still.. well, not stodgy.. more.. filloing. But they're a lot more airy, and bready/cakey than what it sounds like you got. Will send you the recipe when she gets back. Should be in the next few days. The stew looks great but I have never liked dumplings. They weren't something my Mum ever made so guess I just never expected them with a stew in the way some people I know do - give me buttery mash or a pastry lid instead any day! NO NO NO. 4 oz suet, 2 oz. plain flour, 2 oz S.R. flour, 5 tblspns water to quickly mix into 8 balls, flour 'em and pop on top of stew for 30 mins. BIG, FLUFFY, SCRUMPTIOUS THINGIES. I know this is way after your original post but...I have made the Jamie Oliver dumplings before and they were light and fluffy and cooked in about 20-25 mins in the stew, as my Mum used to make them (I'm English). 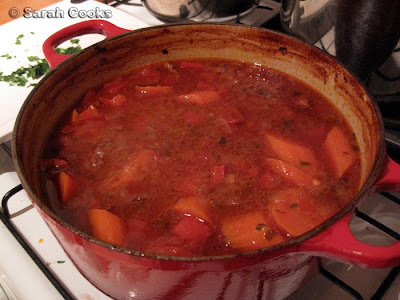 Suspect you didn't cover the stew with a lid - essential - as the dumplings need to steam on top as well as poach in the liquid - Your stew pot doesn't appear to have a lid. Could this be the problem? I think the trick with the recipe is it says 250g of flour, which is actually 2 cups, not 1!! I just made Jamie's dumplings and got tricked with 250g, thinking it was 1 cup of flour, and the dumplings were exactly like Sarah's. If I'd actually made them properly I think they would have been much better.